Utilize snippets: If you go to Google+’s Business Page, you’ll find a form you can fill out that gives you snippets (pieces of HTML code to place in your website). Use them to format your website’s content when it appears in Google+ posts and in Google search results. This format is called Microdata. If you’re familiar with Facebook’s Open Graph Protocol, the good news is that Google+ also recognizes Open Graph Protocol. Therefore, if you’ve already optimized for Facebook, there’s a good chance your site is already configured and optimized for Google+. 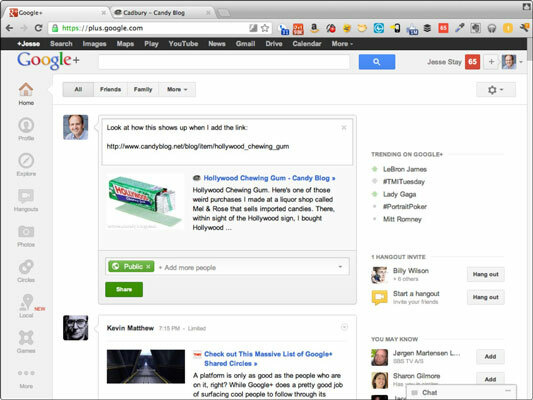 Google+ Page Badges: Badges allow you to tell Google what your Google+ Page is for your website. This allows Google to enable Direct Connect for your website and page, which Google currently enables for only a select number of pages. With Direct Connect, Google will allow people to circle your page right from Google.com search results; your brand will stand out more when people are searching for similar terms. +1 buttons: Having a +1 button on every page of your site can significantly help your site’s ranking among the sites that other Google+ users search for on Google.com. Use author tags. Adding a simple “rel=’author’” option to the bylines of articles on your website, and linking them (via the href attribute) to their authors’ Google+ profiles will make your articles stand out much more strongly among other search results.